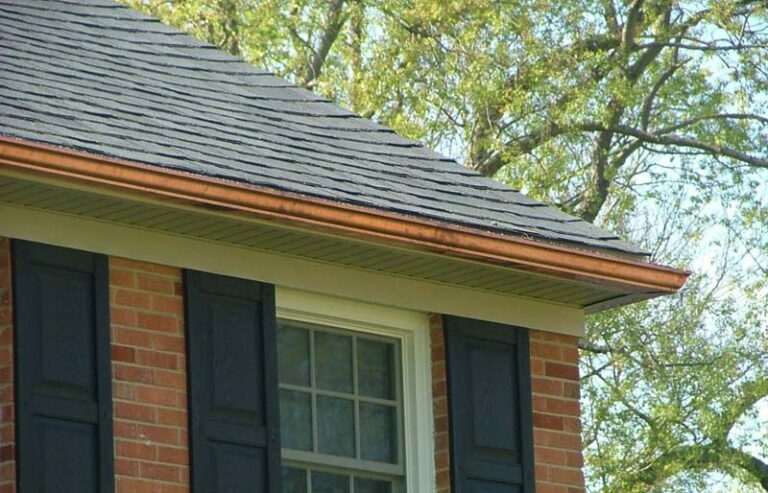 Before you install your gutters, inspect your home’s fascia and soffit to make sure that there’s no rotted wood. If there is, you’ll need to replace it. If your home has trim board or crown molding attached to the fascia underneath the shingles, either remove it or add a piece of wood underneath it to create a flat plane. Measure your home to find out how much gutter material, end caps, downspouts, and elbows you’ll need. It’s easiest to cut and join your gutters together on the ground rather than while you’re on your ladder. Cut your gutters to the length of your home using snips. The easiest way to do this is to snip the sides of the gutter, then bend it and snip the bottom. Cut a two-inch notch in the front lip of the gutter so that you’ll be able to join the section with a corner piece. Lay a bead of gutter sealant about 1 ½” in along the corner, then hook the front lip of the corner over the notched front lip of the gutter. Use your drill and 1/8″ drill bit to drill six holes around the seam of the two pieces. Then, use a rivet gun to rivet the two pieces together. Lay a bead of gutter sealant long the seam and place a dab of sealant over each rivet. The more downspouts you have in your gutters, the faster they’ll drain. On your home, measure where you want to add your downspouts, then make the same measurement on your gutter. Center your downspout outlet and trace around it onto your gutter. Then, cut 1/16″ outside the traced line to form your outlet hole. Predrill 1/8″ holes in your outlet, then lay a bead of gutter sealant around the opening. Place your outlet in the hole and rivet the outlet to your gutter. By sloping your gutters, you’ll help them eliminate standing water that can cause damage. In order to mark the gutter slope, drive a nail ½” below your shingles on the high side of the gutter run. Measure the distance between the nail and the bottom of the fascia board, then mark every 10th foot and subtract ¼” until you reach the low side of the gutter run. Mark the last measurement with another nail, then draw a chalk line between the two nails. Line up the top of your gutters with the chalk line and attach them using a hex screw every two feet. Then, attach gutter hangers to help secure your gutters. When installing your downspouts, you’ll want to install the elbows and the downspout tubes with the crimped sides facing downward. Screw an elbow to the downspout outlet that you created, then hold another elbow against the side of your home and measure between the two openings. Cut a piece of downspout to fit between the two elbows and crimp one end. Create your own downspout brackets by cutting ¼”-pieces of downspout and securing them to the side of your home. Then, secure your downspout to your brackets and run it down to the ground. Attach one last elbow to the end of your downspout to direct water away from your foundation.